Predictions for high and low water for each day of the year for over 680 ports with tidal curves and predictions at each port location presented graphically at 10, 20, 30 and 60 intervals. Predictions of maximum rates with graphical curve of tidal streams for Torres Strait and Port Phillip Heads. Tidal levels for all ports listed. AusTides are published on CD-ROM. They are released annually in October and provide tidal predictions for the year of release and the following calendar year. From time to time AusTides updates may be available from this website on our AusTides Update page. 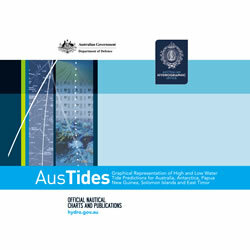 Notifications of updates being available are issued via fortnightly Australian Notices to Mariners (NtM) and can also be supplied automatically, via the eNotices subscription email service. AusTides is compatible with Windows XP, Vista, 7, 8, 8.1 and 10 operating systems. Not compatible with tablet mode. You will need Administrator permission to enter your AusTides registration code. The AusTides can be purchased from your local Distribution Agent. Try before you buy with the AusTides Demo 2015. This demo version is built on the basis of AusTides 2015 with a reduced dataset. It contains two tidal ports and one tidal stream port for evaluation purpopses. Please note that you will need to enter "1111" to register the demo version. Please contact tides.support@defence.gov.au if you have further queries.